Welcome to Eight Weeks to Better Rhode Island Genealogy Research. Good luck with your Rhode Island research! Posts are the property of One Rhode Island Family. This is the page for all things that did not fit well in the other categories, but have been very helpful to me. New England Historic Genealogical Society Library and Manuscript Collections. A wonderful place to visit. the card catalog of the Allen County Public Library in Fort Wayne, Indiana (try limiting your search to materials located in the Genealogy Department). Even if you can’t get there, it will help to know what books exist. Maybe your library could try interlibrary loan for you. NUCMC – National Union Catalog of Manuscript Collections. Allison Goodsell Books, 2528 Kingstown Rd, Kingston, RI – many standard Rhode Island genealogy series and books, secondhand. Paper Nautilus, 5 South Angell, Providence, RI – a variety of important Rhode Island history books, not much genealogy. Lavendier Books online on eBay – a good selection of Rhode Island genealogy classics and history books, secondhand. The Boston Transcript was a Boston, Massachusetts newspaper that regularly carried a page of genealogical questions and answers. That feature ran for several decades in the late 1800’s/early 1900’s. It is gradually becoming easier to locate these papers online. For information about Catholic churches: Catholicism In Rhode Island and the Diocese of Providence, 2 volumes by Robert Hayman. Published by Diocese of Providence, 1982. See also the folks at the American French Genealogy Society. request a pre-1900 divorce record, use this form at the Rhode Island Judicial Records Center. Colonial Justice: Early Rhode Island Court Records Project offers a small set of court records from the Rhode Island Historical Society. Fiske, Jane Fletcher. Gleanings from Newport Court Files 1659-1783. Boxford, Massachusetts: 1998. Fiske, Jane Fletcher, transcriber. Rhode Island General Court of Trials 1671-1704. Boxford, Massachusetts, 1998. Kent County Divorces from Court Records by Katherine Bruce and Violet E. Kettelle. Rhode Island Roots 14:2 (Jun 1988) p. 41-50. Petitions to the Rhode Island General Assembly from the Rhode Island State Archives. Volume 1 (1725-1729): Rhode Island Roots 20:1 (Mar 1994) p. 5-7. Volume 2 (1728-1733): 20:2 (Jun 1994) p. 41-45. Volume 3 (1734-1738): 20:3 (Sep 1994) p. 87-93. Volume 4 (1739-1742): 20:4 (Dec 1994) p. 121-126. Volume 5 (1739-1743): 21:1 (Mar 1995) p. 25-29. Volume 6 (1743-1748): 21:2 (Jun 1995) p. 44-48. Volume 7 (1748-1750): 21:4 (Dec 1995) p. 118-122. Volume 8 (1751-1754) 23:1 (Mar 1997) p. 13-20. The shifting borders of the state and its counties are chronicled on the Newberry Library website. Choose Rhode Island from the map. Taylor, Maureen A. Rhode Island Passenger Lists – Port of Providence 1798-1808; 1820-1872 – Port of Bristol and Warren 1820-1871; Compiled from United States Custom House Papers. Baltimore: Genealogical Publishing Co., 1995. Rhode Island Town Names – An Etymological Study – The Meanings and Origins of the Names of Rhode Island’s 39 Cities and Towns by Bruce Campbell MacGunnigle. Rhode Island Roots 8:3 (Sept 1982) p. 45-50. Continued in 8: 4 (Dec 1982) p. 73-78. I learned a lot from this article! Rhode Island laws, as of 1798, were published in book form, The Public Laws of the State of Rhode Island and Providence Plantations. if you can get to the R.I. State Archives, try their card index to state legislative business. Black and Indian Sailors Born in Rhode Island: Bristol Customs House Protection Papers by Jeffrey Howe. Rhode Island Roots 31:1 (Mar 2005) p. 91-98 and 31:3 (Sep 2005) p. 143-155. New London 31:4 (Dec 2005) p. 196-200. New Bedford 32:1 (Mar 2006) p. 43-44. New Bedford 32:2 (Jun 2006) p. 91-93. Providence 32:3 (Sep 2006) p. 156-163 also 32:4 (Dec 2006) p. 197-207, 33:1 (Mar 2007) p. 34-49. Manumissions in Providence, 1784-1800 by Linda L. Mathew. Rhode Island Roots 32:4 (Dec 2006) p. 193-196. Smithfield, R.I. Manumissions: Glasco, Jenne, and Their Children by Charlotte Scozzafava. Rhode Island Roots 34:2 (Jun 2008) : p. 98-101. Free People of Color in the 1825 Census of Providence, R.I. by Jeffrey Howe. Rhode Island Roots 36:1 (Mar 2010) p. 26-32. Men of Color in the R.I. Regimental Book for 1781 by Bruce C. MacGunnigle. Part One: Piracy and Piety in Newport Rhode Island Roots 38:4 (Dec 2012) : p. 206. Blacks in the 1774 Census of Rhode Island by David Lambert. Rhode Island Roots 22:3 (Sep 1996) p. 90-94. Herndon, Ruth Wallis. Unwelcome Americans (Philadelphia: University of Pennsylvania Press, 2001). Burial Records from the State Institutions at Howard by Florence Patenaude. Rhode Island Roots 24:1/2 (Mar/Jun 1998) p. 71-110. Continued in 24: 3/4 (Sep/Dec 1998) p. 191-258. 24:1 (Mar 1999) p. 24-35. 25:2 (Jun 1999) p. 51-71. 26:3 (Sep 2000) p. 19-41. See additional note 27:1 (Mar 2001) p. 46. Indentures at the Dexter Asylum, 1828-1844 by Maureen Taylor. Rhode Island Roots 22:3 (Sep 1996) p. 68-70. State Farm Records: Abstracts, 1871-1872 by Jean Therrien. Rhode Island Roots 23:2 (Jun 1997) : p. 51-56. 23:3 (Sep 1997) p. 76-79. 23:4 (Dec 1997) p. 112-115. 25:1 (Mar 1999) p. 17-20. Deaths from the Bills of the Overseers of the Poor, Richmond, Rhode Island, 1820-1850 by Vera M. Robinson. Rhode Island Roots 29:2 (Jun 2003) p. 87-88. See addenda 29:3 (Sep 2003) p. 161. Residency Certificates from the Warwick Archives by Cherry Fletcher Bamberg. Rhode Island Roots 31:1 (Mar 2005) p. 32-39. Some Northern Rhode Island Men Unable to Equip Themselves as Required by Law, 1776 by Linda L. Mathew. Rhode Island Roots 33:2 (Jun 2007) p. 106-110. See also Exeter and Richmond 35:1 (Mar 2009) p. 34-37. North Kingstown 37:3 (Sep 2011) p. 142. Notes on Deaths at the Smithfield Town Farm and Asylum, 1865-1870 by Mickey Finn-Jordan. Rhode Island Roots 41:4 (Dec 2015) : p. 191-200. I will be updating this material from time to time. Thanks for your patience as I put these posts together. I wish you a lot of success with your Rhode Island research! That there is a large contingent of people spending their lives documenting military history – collecting interesting stuff (instead of tossing it), making maps, finding photographs, displaying artifacts, preserving graves, and writing books. As genealogists, we suddenly feel like we have partners and colleagues working away on our ancestors. Hurray for that. That the documents you may find in the military sector can be far more revealing than just about anything else. So our job as genealogists is to use all of this great work to give us clues about where to find records. Rhode Island’s own General Nathanael Greene. His homestead is preserved, see http://www.nathanaelgreenehomestead.org. Copy of mezzotint by Valentine Greene, executed by J. Brown after Peale. I am no expert in any of this so I will give some helpful links here and I hope they will be useful. One thing I should say is that for every war that ever affected Rhode Island, there are experts. They may sometimes be hobbyists and their information may be broadcast in unusual ways. Be on the lookout for blogs, particularly blogs written by small groups or organizations, and self-published books. You may find some good leads. Finding your ancestor’s name may be fairly easy. Finding their story is going to take a lot of digging. Think also of archives, manuscripts, veterans groups, lineage societies, biographical works, and local historical societies. Interesting stories or lists for any of these wars may be found in either Rhode Island Roots or Rhode Island History. If federal pensions are found to exist, they can be ordered from the National Archives. Small State Big History is good example of a site where some fascinating historical work is being recorded. King Philip’s War, 1675-1678. Although initially hoping to avoid military engagements with the Narragansetts, Rhode Island did eventually become embroiled in King Philip’s War. Craig Anthony has written some books about Rhode Island’s (and the Tefft family in particular) involvement in a horrific assault that occurred in southern Rhode Island called “The Great Swamp Fight.” After the war, land in East Greenwich, Rhode Island was offered to a group of veterans (see the History of East Greenwich), and nearby Voluntown, Connecticut was founded to distribute land to veterans. I usually refer to Soldiers in King Philip’s War by George M. Bodge for information about the war itself, but no doubt better modern sources are available. French and Indian Wars, 1754-1763. A List of Rhode Island Soldiers & Sailors in the Old French & Indian War, 1755-1762 by Howard Chapin contains some information and names. Rhode Island sent many soldiers to the war. Newport was occupied by the British from late 1776 to 1779, resulting in a severe disruption to the rising importance of Newport, and the eventual emergence of Providence as the center of manufacturing, education and government, although that emergence grew slowly over the next hundred years. Rhode Island in the American Revolution by Eric G. Grundset – a recent bibliography of resources for the late colonial period. This is a must-see – Mr. Grundset will point to numerous record sets that will help you research your ancestor’s service. Benjamin Cowell’s Spirit of 76 in Rhode Island. Mr. Cowell was instrumental in helping the old soldiers obtain the pensions granted to them by Congress in the 1830’s. He personally heard their stories, and the stories of officers, friends and neighbors who served. By 1850, he had put together this book, listing some very brief service records, wishing that he could make an even more complete report. In my experience, if your ancestor is listed here, keep seeking further service records because he usually only listed a portion. James Arnold provided an index to Cowell in volume 12 of his Vital Record of Rhode Island. Revolutionary War Index at the Rhode Island State Archives. A slip index of notations for RW soldiers mentioned in various resources at several Rhode Island repositories. Each slip will give an abbreviated citation back to the source. Some soldiers have one or two slips, some have dozens. This is only on paper as far as I know. Slips in the Revolutionary War index file for my ancestor Richard Ballou. Rhode Island Historical Society has a Revolutionary War index as well; it often leads to original payrolls or reports in their manuscript collection. See also this finding aid. Fold3.com contains many military records, especially for federal government units. It also contains valuable pension records. Rhode Island Loyalists by Paul J. Bunnell. Rhode Island Roots 25:1 (Mar 1999) p. 21-23. Some information about sources from the Rhode Island Historical Society. This link opens a pdf list of soldiers from the Rhode Island State Archives. Fold3.com is building a set of digital pension records from the National Archives. My relative, named Ballou, was in there, but for letters farther down the alphabet, the set is not yet finished. A marriage record found in a pension file. From the War of 1812 pension file of Augustus Ballou, Fold3.com. The most valuable pension record I have ever found for my family, a 96-page document that unlocked the secrets of my gg-grandmother’s birth, was from a Mexican War pension. I had to order it from the National Archives. Try starting on Fold3.com in the Mexican War section, to see if some record may exist. I have now found two Mexican War pensions that were very helpful. Like many Americans, I have relatives on both sides of this war thanks to my Yankee ancestor who got the bright idea to start a business in Alabama in 1852. That did not work out well, but his sons joined the Alabama militia in 1861. There are, of course, hundreds of possible sources. People are still working on this history and still publishing. Always check for new work. Just as one example, see this essay by Robert Grandchamp and also his book Rhode Island and the Civil War: Voices from the Ocean State and Frank Grzyb’s Hidden History of Rhode Island and the Civil War. The national Soldiers and Sailors system. Fold3.com has many records. Ancestry.com has a surprisingly large set of records, and more and more books are finding their way into Ancestry’s records. The Providence Public Library holds some regimental histories and other materials. Always look for a regimental history; many were published. Intrepid FindAGrave.com contributor Jen Snoots has a Civil War virtual cemetery for Rhode Island built at Findagrave.com. The R.I. State Archives holds some original records. Andersonville Prison records can be searched. The Civil War Sesquicentennial page and a brief overview of Rhode Island’s involvement by Frank Williams. This was the first war with photographs (see further information here from Maureen Taylor) and artistic renderings meant for publication. Also, some casualty reports were printed in newspapers. These should be sought for the particular person being researched. The R.I. state census of 1865 asked about military service. It is available at Ancestry.com. See my previous 8 Weeks post on census records. I like this website for the East Greenwich Kentish Guards. Looking for smaller websites is worthwhile. The dedication of the Soldiers and Sailors Monument in Providence in 1871 was a very moving day. See “Proceedings at the Dedication of the Soldiers’ and Sailors’ Monument in Providence” to which is appended a list of the deceased soldiers and sailors whose names are sculptured upon the monument. (Providence: A Crawford Greene, Printer to the State, 1871). Soldiers and Sailors Memorial, Providence. Photo by Diane Boumenot. For later wars, even more information should be available through Ancestry.com and Fold3.com. The digital availability of pension records expands all the time; check online first but then order the full record from the National Archives link near the top of this post. The post you are reading is the property of One Rhode Island Family. Published compiled genealogies, whether they be books or journal articles, can move our genealogy forward by leaps and bounds. If the material is of poor quality, though, and if we accept it at face value and don’t pursue the research ourselves, it can jeopardize all our future work, sending us down the wrong roads and setting us up to build tree sections that are completely false. If you think about it, there is only one correct family tree for any of us; only one true sequence of events that led to the unique people we are. There is no “close” in genealogy. There is “correct” and “incorrect.” Which is not to say we should or could expect to ever know the full truth, going back a dozen or more generations; there are so many reasons why some “truth” just will not be found by us. But for the parts of the tree we are able to build, we as genealogists want them to be correct. I think one of the first things New England genealogists find are those family genealogies published in the late 1800’s. Googling the name, such as “Ballou genealogy” or “Ballou genealogy book” will usually pull up a pdf of the item, if it exists. My advice would be to download and save such books in folders on your computer, if they relate to your family, and always use the “Comments” feature in Acrobat Reader to mark each page that is significant to you. See more about searching for books on How to Build your Digital Library. dependent on the genealogical expertise of the author, so look around for evidence of that. A good genealogist like Adin Ballou (An Elaborate History and Genealogy of the Ballou Family in America, 1888) may not have used proper footnotes (it was not the custom at the time) but he sprinkled every page with clues as to the sources of his information – deed books with page numbers, dates of probate documents, and many statements like “birth date not found.” If you use data from these books in your tree, always follow up by checking for the records used. When using these books, always check around for supplements, addenda, and later corrections. QUICK FACT – When approaching an indexed family genealogy for the first time, seeking information about a couple, a good shortcut is to search for the last name of the spouse instead of the person who holds the name featured in the book (there will be too many of those). Sadly, the search described above is where many genealogists leave off. Therefore, they miss the thousands of genealogy books, also of varied quality, published since 1923 and, in some cases, still under copyright. A book under copyright will seldom be found as a pdf online. It might be for sale somewhere, it might show up as a Google Book in which only a bit of searching is possible (no pdf available), or, more likely, it is sitting on a few library shelves here and there. I’m not going to provide a master list of books on Rhode Island families, much as I would like to, and I may try that someday. But here is how I approach this problem. Check out the online card catalog of the Rhode Island Historical Society’s Robinson Research Center. They have lots of compiled genealogies there. Try, for instance, Advanced Search for the subject “Ballou Family.” This catalog does not cover everything at the library. Always use WorldCat.org to search as well; each entry will come up with the libraries that hold the book, sorted by distance from you. FamilySearch.org also has a “Books” search. I like the card catalog of the Allen County Public Library in Ft. Wayne, Indiana. Try the Ocean State Libraries catalog to find out what is in Rhode Island’s public libraries. Searching for “Ballou family” in the Ocean State public library catalog. The entry will tell you which Rhode Island libraries that hold the book. Guide to Published Genealogies in the Library of the New England Historic Genealogical Society (Boston: NEHGS, 2012). I use this book a lot. No doubt the NEHGS online catalog, linked above, would provide similar information, but I find the book format very easy to follow. Guide to Published Genealogies has a large alphabetical guide to family history books as well as a guide to town and local histories. Photo by Diane Boumenot. There are books which serve as guides to the literature of your family’s genealogy, or overviews of the genealogies of large areas. The most important: John O. Austin’s The Genealogical Dictionary of Rhode Island; Comprising three generations of Settlers who came before 1690. I strongly recommend NOT using an older version of this; you need the 1968 or later version with corrections, published by Genealogical Publishing Company. This large black book is printed as a marked-up copy, providing references to all The American Genealogist articles correcting and expanding Austin’s work. The Bennett entry in Austin’s Genealogical Dictionary of Rhode Island. This is the way the book was printed. I know. It’s weird. For a reasonably priced way to access brief bibliographies of the settlers detailed in the 10 volumes of the Great Migration series, try The Great Migration Directory: Immigrants to New England, 1620-1640, A Concise Compendium by Robert Charles Anderson (Boston, NEHGS, 2015). Another choice would be to access some of the material online through NEHGS membership – use Database Search – Category: Great Migration Study Project. The Great Migration series and Directory. Photo by Diane Boumenot. Savage, James. A Genealogical Dictionary of the First Settlers of New England, in four volumes. Baltimore: Genealogical Publishing, Inc., 1998 (orig. 1860-62). The Great Migration is far superior to this source, and if you can use that, no need to consult Savage. Cutter, William Richard. Not much better than mug books, with lines of descent traced only to wealthy southern New Englanders, but still, I have a soft spot for Cutter. The entries are always fun to read and very interesting, but unsubstantiated. New England families, genealogical and memorial; a record of the achievements of her people in the making of commonwealths and the founding of a nation. Four vols. New York: Lewis Historical Pub. Co., 1915. Genealogical and Personal Memoirs Relating to the Families of Boston and Eastern Massachusetts. Four vols. Baltimore: Clearfield Co. (orig. 1908). Have you ever thought, I wish I could hire one of the country’s top experts to find that elusive ancestor for me? Have you ever considered that you could possibly get such work for free? Here’s how. Do a thorough search of all the genealogy journals that cover the area in question. You need to be sure that your important question has not already been researched by someone really competent, complete with reasoned arguments and footnotes. Even finding an article in a quality journal about the county or town you are researching can be a treasure-trove of sources and strategies. I always read the footnotes first. Most organizations do not give their journal away online. You need to belong to that society, or subscribe to something that will offer access, or seek out a library with subscriptions. Likewise, just finding an index to each journal is not a trivial problem. 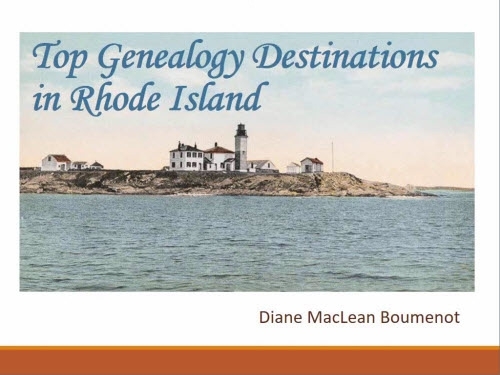 Of those, of course, Rhode Island Roots is the most important for Rhode Island research, however, there are some outstanding genealogists producing articles for all the prestigious journals concerning Rhode Island topics. For additional journal suggestions, see this article. Suggestion 2: The second easy way to access some quality pre-1990 articles is to locate in a library the four volumes of articles published by the Genealogical Publishing Company, below. Each set contains a thorough index. Genealogies of Rhode Island Families From the New England Historic Genealogical Register, 2 vols. Baltimore: Genealogical Publishing Company, 1989. Specifically, see Gary Boyd Roberts’ brief bibliographies of 100 Rhode Island families, page xix – xxxiv. Remember, that was current in 1989. This set, and the set below, are very thoroughly indexed at the back of volume 2. Genealogies of Rhode Island Families From Rhode Island Periodicals, 2 vols. Baltimore: Genealogical Publishing Company, 1983. The two sets of Genealogies of Rhode Island Families. Note there is a substantial index at the back of each. A huge number of local history and genealogy journals are indexed through PERSI, a database available through your local library and/or FindMyPast.com The indexing is not extensive; they are mostly indexed by general topic, but could be good if there was an article about your family or town. Once a citation is found, you will need to seek out the article itself. I am not sure about the current status of PERSI; consult your local librarian for help. Check out family genealogical materials at the Newport Historical Society. Index To Genealogical Periodicals, vol. I (1932) and vol. II (1948) , compiled by Donald Lines Jacobus. Index to Early Records of the Town of Providence, by Richard leBaron Bowen (Oxford Press, 1949). Mr. Bowen, a noted Rhode Island genealogist, realized the potential of the Early Records index to help descendants of early Providence families to trace their ancestors, even if they were otherwise poorly documented, so he added a list of families included in Austin’s Genealogical Dictionary of Rhode Island (listed above) on page 87-93, plus a brief bibliography of articles on Rhode Island families in the decades leading up to 1950, on pages 93-97. Of all the genealogies that actually have helped me, these are the ones I recommend most highly. If I had different ancestors, the list would be different. These selections make it clear that helpful genealogies are not always online, and are not always found in book form. ALDRICH – The Aldrich Family Genealogy – Descendants of George Aldrich of Mendon, MA, a manuscript compiled by Ralph Ernest Aldrich (1902-1984) and his wife Pearl Lillian (Marquis) Aldrich. 18 volumes. ANDREWS – Harriet Francis James had her untitled manuscript on the Kent/Washington County Andrews published as a newspaper column, later compiled in a three volume manuscript by Anthony Tarbox Briggs. ARNOLD – The Arnold Family of Smithfield, Rhode Island by Richard H. Benson. Boston: Newbury Street Press, 2009. For advice on finding this book and on the other Arnold lines in Rhode Island, see “Meet the Arnolds“. BALLOU – An Elaborate History and Genealogy of the Ballous in America by Adin Ballou. Providence: E.L. Freeman & Son, 1888. BOWEN – Richard Bowen (1594?-1675) of Rehoboth, Massachusetts and His Descendants by William B. Saxbe Jr. 3 volumes, Hope, Rhode Island: Rhode Island Genealogical Society, 2011-2015. What I would say about this set is ALWAYS seek out the highest quality work in an area to see if it can help you. This one is exceptionally well done. Another such example – Thomas Clemence of Providence, Rhode Island by Jane Fletcher Fiske and Roberta Stokes Smith. Greenville, R.I.: Rhode Island Genealogical Society, 2007. DARLING – Dennis Darling of Braintree and Mendon, by William and Lou Martin, 2006. In addition to genealogical information on the Darlings, the book contains brief sections on the intermarried families of Cook, Southwick, Thayer, and Thompson. There are about 5000 footnotes which will help you find specific records concerning your ancestors. This book can sometimes be accessed through FamilySearch.org – Search – Books. Scott Andrew Bartley. “George Lanphear of Westerly, Rhode Island and his Descendants.” New England Historic Genealogical Register 153 (April 1999): 131-140. Scott Andrew Bartley. “George Lanphear of Westerly, Rhode Island and his Descendants, Part 2.” New England Historic Genealogical Register 159 (October 2005): 333-340. Scott Andrew Bartley. “George Lanphear of Westerly, Rhode Island and his Descendants, Part 3.” New England Historic Genealogical Register 160 (January 2006): 47-59. Bamberg, Cherry Fletcher. “Major Henry Rice of Warwick and His Family.” Rhode Island Roots 24 (March/June 1998): 1 – 60. Bamberg, Cherry Fletcher. “John1 Rice of Warwick, Rhode Island.” Rhode Island Roots 24 (September/December 1998): 153-168. Bamberg, Cherry Fletcher. “John2 Rice, Jr., of Warwick, Rhode Island.” Rhode Island Roots 25 (September 1999): 81-118. Bamberg, Cherry Fletcher. “John2 Rice, Jr., of Warwick, Rhode Island.” Rhode Island Roots 26 (September 2000): 57-84. Bamberg, Cherry Fletcher. “John2 Rice, Jr., of Warwick, Rhode Island (concluded).” Rhode Island Roots 27 (March 2001): 1 – 26. SMITH – Farnham, Charles William. “John Smith, The Miller, of Providence, Rhode Island – Some of His Descendants” in Genealogies of Rhode Island Families From Rhode Island Periodicals, volume II, p. 1 – 150. Baltimore: Genealogical Publishing Co., 1983 [originally appeared in the 1960’s as a series of articles in Rhode Island History, v. 20 – 24]. It’s not that this work is so superb, although maybe it is, it’s just that it’s so hard to work with the name Smith. WILLIAMS – Descendants of Roger Williams, Book 1 – Book 5. The website of the Roger Williams Family Association allows you to peruse the first four generations of descent online. After that, it’s necessary to consult the books. Should you find a book that you would like to purchase, I usually try Higginson Books, Genealogical Publishing, and Heritage Books for reprints. I also look on eBay.com and Amazon.com, although lately I find older books on Amazon to be overpriced, sometimes ridiculously so (often a more thorough search online for the tiny publisher’s website brings up a much more attractive price than anything you will find on Amazon.com.) In a pinch, my best advice for a local Rhode Island used bookstore is Allison B. Goodsell, Rare Books, also called the Kingston Hill Store. Be sure to check out the post about sources of local town records since some of those offer genealogical information about specific families. A Providence Door-yard. From Sketches of Early American Architecture by O.R. Eggers, 1922. Welcome to 8 Weeks to Better Rhode Island Genealogy Research Week 5 – Town Records, Histories and Newspapers. This covers location-specific books, town records, and newspapers. Town records, published histories, and local newspapers are where the stories of our ancestors may be hiding. To know that our ancestors spent one or more generations in a town, and yet know very little about that town, or even worse, to assume we know enough without research, is to ignore our role as family story-finders. (early records) notes on real estate, for instance, swapping tracts of land. Later, such functions would be assigned to, say, a town clerk and be recorded separately. Always check Rhode Island Roots for various town records and lists transcribed there, and Rhode Island History, published by the Rhode Island Historical Society. Check the card catalog and manuscript finding aids at the Rhode Island Historical Society. A call to the town library with specific content-related questions (e.g., do you know of any local shipbuilding records? Do you have any diaries or old documents from a certain neighborhood?) as well as a search for a local historical house or society is always worth doing. And lastly, the Narragansett Historical Register should be searched. The major state histories usually describe the development of each early town and the subsequent spun-off towns. These books contain some great illustrations, that might work well in your own family history book if they are no longer under copyright. Arnold, Samuel Greene. History of the State of Rhode Island and Providence Plantations, vol 1 vol 2. New York: D Appleton & Co., 1859. Bicknell, Thomas Williams. 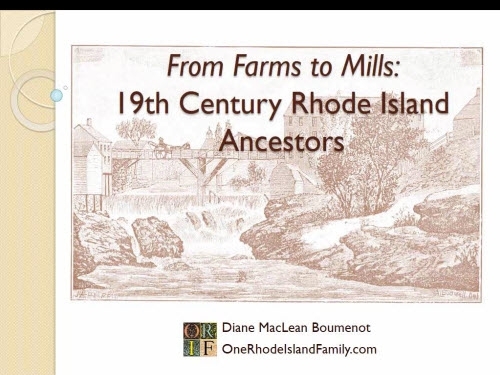 The History of the State of Rhode Island and Providence Plantations. vol 1 vol 2 vol 3 vol 4 vol 5 vol 6 (not available online as a pdf). A search of all volumes is available with an Ancestry.com subscription here. New York: The American Historical Society, 1920. 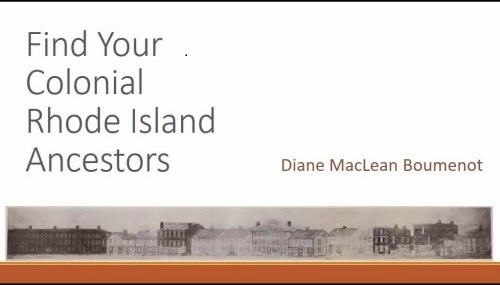 Field, Edward, State of Rhode Island and Providence Plantations at the End of the Century: A History. vol 1 vol 2 vol 3. Boston, Mason Pub. Co., 1902. James, Sidney. Colonial Rhode Island: A History. New York: Scribner, 1975. (original records transcribed; not a narrative history:) Bartlett, John R. Records of the Colony of Rhode Island and Providence Plantations in New England. Providence: A.C. Greene and Bros., State printers, 1856. MANY original town record books are now included in the new Ancestry.com probate record set for Rhode Island, but it will not be obvious how to find them and they are not likely to be indexed. For a guide and key to navigating those record sets, visit the post on probate records. Adams, Virginia H. Historic and Architectural Resources of Barrington, Rhode Island. Providence, R.I. (150 Benefit St., Providence 02903) : Rhode Island Historical Preservation Commission, 1993. A History of Barrington, Rhode Island. Providence : Snow & Farnham, 1898. Barrington Soldiers in the War of the Revolution, the Dorr War and in the War of the Rebellion. Providence, R.I. : Snow and Farnham, 1898. Sowams: with Ancient Records of Sowams and Parts Adjacent. New Haven, 1908. The History of Rehoboth, Seekonk, East Providence, Pawtucket & Barrington. Seekonk, Mass. : J. G Erhardt, n.d. (1982-1990?). Rehoboth, Plymouth Colony, 1645-1692 : volume II: A History of Rehoboth, Seekonk, Swansey, Attleboro & No. Attleboro, Mass., East Providence, Barrington, & Pawtucket, R.I. Seekonk, Mass. : J.G. Erhardt, 1983. A History of Rehoboth, Seekonk, Mass. Pawtucket & East Providence, R.I.1692-1812. Volume III. Seekonk, Mass. : J.G. Erhardt, 1990. Gizzarelli, Nicholas. The Revolutionary and Civil War Records. [Barrington, Rhode Island] : [Nicholas Gizzarelli], n.d. There are at least five volumes in this set about various East Bay towns, by John G. Erhardt. This volume contained an 1888 newspaper extract about a barn fire at the home of my ggg-grandfather, William Murdock. Cirillo, Susan E. Bibliography of Materials Relating to the History of Bristol, Rhode Island. [Kingston, R.I.], 1983. Cirillo, Susan E. and John Pozzie Lombard. Bristol: Three Hundred Years. Providence: Franklin Graphics, 1980. Howe, George Locke. Mount Hope: A New England Chronicle. New York, Viking Press, 1959. Howe, M. A. DeWolf. Bristol, Rhode Island: A Town Biography. Cambridge, Mass. : Harvard University Press, 1930. Mathew, Linda L. Bristol, Rhode Island Town Council Records: 1760-1811. Hope, R.I.; Rhode Island Genealogical Society, 2014. Munro, Wilfred Harold. The history of Bristol, R.I. : the story of the Mount Hope lands, from the visit of the Northmen to the present time. Providence: J.A. & R.A. Reid, 1880. See also his Tales of an Old Seaport, Princeton University Press, 1917. Thompson, Charles O.F. Sketches of Old Bristol. Providence: Roger Williams Press, 1942. Keach, Horace A. Burrillville; As It Was, and it is. Providence: Knowles, Anthony & Co, 1856. Mehrtens, Patricia A. One Hundred Years Ago in Burrillville: Selected Stories from Local Newspapers. Bowie, Md: Heritage Books, 1992. Haley, John Williams, Roscoe Morton Dexter, Mrs. Herbert Gould Beede. The Lower Blackstone River Valley; the Story of Pawtucket, Central Falls, Lincoln, and Cumberland, Rhode Island. Pawtucket, R.I.: E.L. Freeman Co., 1937. The Charlestown Bicentennial Book Committee. Reflections of Charlestown, Rhode Island 1876-1976. Westerly, R.I.: The Utter Company, 1976. Five Families of Charlestown, Rhode Island : Bliven, Crandall, Macomber, Money, Taylor. Catskill, N.Y.: E.P. Crandall, 1993. Charlestown in the Mid 19th Century, As Seen through the Eyes of “Uncle Phineas” (Nelson Byron Vars). 1992. Fish, Joseph. Old Light on Separate Ways: the Narragansett Diary of Joseph Fish, 1765-1776. Hanover, N.H., University Press of New England, 1982. Mandeville, Frances W. The Historical Story of Charlestown, Rhode Island. Charlestown, R.I.: Charlestown Historical Society, 1979. Tucker, William Franklin. Historical Sketch of the Town of Charlestown in Rhode Island : from 1636 to 1876. Westerly, R.I. : G.B. & J.H. Utter, steam printers, 1877. See also Western Rhode Island Civic Historical Society periodicals: Hinterlander and Proceedings. Harpin, Mathias Peter and William Koji. Prophets in the Wilderness: A History of Coventry, Rhode Island. Oneco, Conn.: Harpin’s Connecticut Almanac, 1974. Hey, Catherine. “Gleanings from Rhode Island Town Records: Early Coventry Records.” Rhode Island Roots. Special Bonus Issue 2010 (April 2010). Levesque, George A. Coventry: The Colonial Years 1741-1783. [Typescript, Master’s Thesis, Brown University], 1969. Warnings out from Coventry Town Council Minutes transcr. by Linda L. Mathew. Rhode Island Roots 29:1 (Mar 2003) p. 9-30. Brayton, Gladys W and William M. Carpenter. Other Ways and Other Days. E. Providence: Globe Printing, 1975. Clauson, J. Earl. Cranston: A Historical Sketch. Providence: T.S. Hammond, 1904. Balfour, David W and Joyce Hindle Koutsogiane. Cumberland by the Blackstone: 250 Years of Heritage. Virginia Beach: The Donning Company: 1997. Ray, Judith Jenckes. Founders and Patriots of the Town of Cumberland, Rhode Island. Baltimore : Gateway Press, 1990. Simpson, Robert. North Cumberland: A History. [Chelsea, Vt.] : [Acorn Press], . Sprague, Abigail A. (Field). “Abigail Sprague’s History of Cumberland.” Mss. 1023. The Rhode Island Historical Society Research Center, Providence, Rhode Island. This map of 1820 East Greenwich is provided as evidence that King Street, leading down to the bay, was the main thoroughfare of East Greenwich, not Main Street, where my ancestor had a house. That goes a long way to explain how my ancestor could afford such a classy address in 1800 — maybe it wasn’t. Partial snapshot from The History of East Greenwich by McPartland, p. 51. Adamson, Thaire H. and Marion Fry. A History of East Greenwich Rhode Island : as published in The East Greenwich Packet. East Greenwich, R.I. : East Greenwich Preservation Society, 1996. Bamberg, Cherry F. Elder John Gorton and the Six Principle Baptist Church of East Greenwich, Rhode Island. Greenville, R.I: Rhode Island Genealogical Society, 2001. Bamberg, Cherry Fletcher. “Gleanings from Rhode Island Town Records: East Greenwich Town Council Records, 1734-1774.” Rhode Island Roots. Special Bonus Issue 2008 (April 2008). Bamberg, Cherry Fletcher. “Gleanings from Rhode Island Town Records: East Greenwich Town Council Records, 1775-1800.” Rhode Island Roots. Special Bonus Issue 2009 (April 2009). Eldridge, James H. and Daniel H Greene. History of East Greenwich. A series of articles published in the East Greenwich Weekly Pendulum, June 8 – Nov. 17, 1860. Greene, D.H. History of the Town of East Greenwich and adjacent Territory, from 1677 to 1877. Providence: J.A. and R.A. Reid, 1877. MacGunnigle, Bruce C. Strolling in Historic East Greenwich. Charleston, SC: CreateSpace Independent Publishing Platform, 2014. McPartland, Martha R. The History of East Greenwich, Rhode Island, 1677-1960: with related genealogy. East Greenwich, R.I.: East Greenwich Free Library Association, 1960. Miller, William Davis. Notes and Queries concerning the Early Bounds and Divisions of the Township of East Greenwich: as set forth in William Hall’s plat. Providence: E.L. Freeman Co., . Potter, Elisha R. Memoir Concerning the French Settlements and French Settlers in the Colony of Rhode Island. Baltimore: Genealogical Pub. Co, 1968. Conforti, Joseph. Our Heritage: a History of East Providence. White Plains: Monarch, 1976. Hoyt, Harold W. The Story of Hunts Mills, East Providence, R.I. 2nd. ed. Providence: Snow and Farnham, 1897. Wood, W. LeRoy. “First Settlers in East Providence.” Rhode Island Historical Society Collections, 24 (1931), 92-96. Simister, Florence P. A Short History of Exeter, Rhode Island. Exeter, R.I.: Exeter Bicentennial Commission, 1978. Early Historical Accounts of Foster, Rhode Island. Glenview, Ill.: Moshassuck Press, 1993. Contains Charles C. Beaman’s “Sketches of Foster” and Casey B. Tyler’s “Historical Reminiscences of Foster.” Indexed by Kenneth W. Faig. Ferraro, William Michael. “Lives of quiet desperation : Community and polity in New England over four centuries : the cases of Portsmouth and Foster, Rhode Island.” Dissertation: Ph. D., Brown University 1991. “First Tax List for Foster RI After Division from Scituate RI” transc. by Margery I. Matthews. Rhode Island Roots 12:2 (Jun 1986) p. 29-32. [look for short works issued by the Foster Preservation Society in the 1980’s – 1990’s including “Tax Records 1781, 1787, 1798” and “Peleg’s Last Word: The Story of the Foster Woolen Manufactory.”]. Murray, Thomas Hamilton. “Sketch of an Early Irish Settlement in Rhode Island.” American-Irish Historical Society, Journal, 2 (1899), 152-157. Fiske, Jane Fletcher, transcriber. Glocester 1778 Tax List: “A List of the Polls and Estates Real and Personal of the Proprietors and Inhabitants of the Town of Glocester in the State of Rhode Island.” Rhode Island Roots, volumes 19 (1993) through 20 (1994). Perry, Elizabeth A. A Brief History of the Town of Glocester, Rhode Island. Providence: Providence Press Co, 1886. Glocester, the way up country : a history, guide and directory compiled by The Heritage Division, Glocester Bicentennial Commission. Glocester, R.I. : Town of Glocester, 1976. Griswold, S.S. Historical sketch of the town of Hopkinton : from 1757 to 1876, comprising a period of one hundred and nineteen years. Hope Valley, R.I. : L.W.A. Cole, Job printer, 1877. History of the town of Hopkinton, Rhode Island, 1757-1976 : historical facts compiled by Hopkinton Bicentennial Commission. Publication Committee. Westerly, 1976. “The Patriots of Hopkinton, Rhode Island, 1776.” Narragansett Historical Register, 4:2 (1885). Transcribed on USGenWeb thanks to Susan Irish Nahas. Watson, Walter L. History of Jamestown on Conanicut Island in the State of Rhode Island. Providence, 1949. McGowan, Louis and Virginia Brunelle. Johnston, Rhode Island ; 1759 to 2009 : 250th Anniversary. Johnston Historical Society. Johnston Historical Society : Printed by the Louis Press, 2009. “A Valuation of the Rateable Property of the Town of Johnston.” Rhode Island Roots 11:2 (Jun 1985) p. 35-37. Greene, Welcome A. Historical Sketch of the Town of Lincoln, in the State of Rhode Island. Central Falls, R.I.: E.L. Freeman, 1876. Lisle, Janet Taylor. First light: Sakonnet, 1660-1820 : the history of Little Compton. Little Compton, R.I. : Little Compton Historical Society, 2010. Pierre-Louis, Marion. The stories houses tell : a collection of Little Compton house histories. Little Compton, RI : Little Compton Historical Society, 2015. Little Compton families. Little Compton, R.I., Little Compton Historical Society, 1967.
and Carlton C Brownell. Notes on Little Compton : from records collected by Benjamin Franklin Wilbour. Little Compton, R.I. : Little Compton Historical Society, 1970. Arnold, Samuel Greene. An historical sketch of Middletown, R.I. : from its organization, in 1743, to the Centennial year, 1876. Newport [R.I.] J. P. Sanborn & Co., 1876. Arnold, James N. The Records of the Proprietors of the Narragansett: Otherwise Called the Fones Record ; Rhode Island Colonial Gleanings. Baltimore, MD: Genealogical Publishing Company, 1990. Carpenter, Esther Bernon. South County Studies. Boston: D.B. Updike, 1924. The Narragansett Friends’ Meeting in the Xviii Century: With a Chapter on Quaker Beginnings in Rhode Island. Boston: Houghton, Mifflin and Co, 1899. Thomas Hazard, Son of Robt Call’d College Tom: A Study of Life in Narragansett in the Xviiith Century. Boston: Houghton, Mifflin and Co, 1893. Views of Narragansett Pier. Tibbetts & Preston, 1884. Updike, Wilkins. History of the Episcopal Church in Narragansett, Rhode Island. New York, Henry M. Onderdonk, 1847. [note: includes genealogical material]. Livermore, S.T. History of Block Island, Rhode Island. reprinted 1961. See also his Map and Guide, Historic Sketch, 1882. Moriarty, G. Andrews. “Early Block Island Families” – a series of articles in the New England Historical and Genealogical Register during the late 1920’s. Sheffield, William P. A Historical Sketch of Block Island. 1876. Capron, John F. III. “Genealogical Clues from Newport, R.I. Customs District Records.” Rhode Island Roots 38:1 (Mar 2012) p. 33-54. Coughtry, Jay, and Daniel Lewis. Papers of the American Slave Trade: Series B. Bethesda, MD: University Publications of America, 2002 (a large microfilm collection of Newport Historical Society holdings). Ebb Tide in New England: Women, Seaports, and Social Change, 1630-1800. Boston: Northeastern University Press, 1998. A Dependent People: Newport, Rhode Island, in the Revolutionary Era. New York: Fordham University Press, 1985. Jefferys, C P. B, and C P. B. Jefferys. Newport: A Short History. Newport, R.I: The Society, 1992. Simpson, Richard V. Historic Tales of Colonial Rhode Island: Aquidneck Island and the Founding of the Ocean State. Charleston, SC: The History Press, 2012. Stensrud, Rockwell. Newport: A Lively Experiment 1639-1969. Newport, RI: Redwood Library and Athenaeum, 2006. Troost-Cramer, Kathleen. True Tales of Life & Death at Fort Adams. Charleston, SC: The History Press, 2013. Youngken, Richard C. African Americans in Newport : an introduction to the heritage of African Americans in Newport, Rhode Island, 1700-1945 [Providence, R.I.] : The Newport Historical Society, 1998. They just don’t make book titles like they used to. Wickford is a village in North Kingstown. Conley, Patrick Thomas. North Kingstown: An Historical Sketch. Providence: Rhode Island Bicentennial Commission, 1976. Griswold, Frances I. S. Old Wickford: The Venice of America. Milwaukee, Wisconsin: Young Churchman, 1900. Loxton, George R. Davisville, Rhode Island: A History of the Textile Mill Village of Davisville, North Kingstown, Rhode Island, Since the Arrival of Joshua Davis in 1694. Baltimore: Gateway Press, 2001. “Notes on Quidnesset“, from the Narragansett Historical Register. Woodward, Carl R. Plantation in Yankeeland: The Story of Cocumscussoc, Mirror of Colonial Rhode Island. Chester, Conn: Pequot Press, 1971. Angell, Frank C. Annals of Centerdale In the town of North Providence, Rhode Island Its Past and Present. 1636-1909. By author, 1909. Nebiker, Walter E. The History of North Smithfield. North Smithfield Bicentennial Commission, 1976. Boucher, Susan Marie. The History of Pawtucket, 1635-1976. Pawtucket Public Library, 1976. Goodrich, Massena. Historical Sketch of the Town of Pawtucket, Rhode Island. Originally Pawtucket, R.I., 1876, reprinted Heritage Books, 2012. Brigham, Clarence S. The Early Records of the Town of Portsmouth. Providence, R. I., E. L. Freeman & Sons, state printers, 1901. Ferraro, William Michael. “Lives of quiet desperation : Community and polity in New England over four centuries : the cases of Portsmouth and Foster, Rhode Island.” Dissertation: Ph. D., Brown University, 1991. Historic Houses of Portsmouth, Rhode Island. Portsmouth: Garman, 1976. Pierce, John T. Historical Tracts of the Town of Portsmouth, Rhode Island. 1991. Taft, Donald R. Two Portuguese communities in New England. Dissertation: PhD., Columbia University, 1923. West, Edward Homer. History of Portsmouth, 1638-1936. Providence, R.I. : J. Green, 1936. Bamberg, Cherry Fletcher. 1776 Census of Providence, Rhode Island. New England Historic Genealogical Register, 159 (Jan 2005): 12-24 and (April 2005) 141-154. Brown University. Historical Catalog of Brown University, 1764-1914. Providence: Brown University, 1914. Hopkins, Charles Wyman. Home Lots of the Early Settlers of the Providence Plantations. 1886, reprinted Baltimore: Genealogical Publishing Co, 2007. Kimball, Gertrude S. Providence in Colonial Times. Boston: Houghton Mifflin, 1912. Lemons, J. Stanley. Baptists in Early North America: Volume II, First Baptist Church in Providence. Macon, Georgia: Mercer University Press, 2013. “Gleanings from Rhode Island Town Records: Providence Town Council Records, 1770-1788.” Rhode Island Roots. Special Bonus Issue 2006 (April 2006). “Gleanings from Rhode Island Town Records: Providence Town Council Records, 1789-1801.” Rhode Island Roots. Special Bonus Issue 2007 (April 2007). “Manumissions in Providence, 1784-1800.” Rhode Island Roots 32:4 (Dec 2006) p. 193-196. Staples, William R. Annals of the Town of Providence, from its first settlement to the Organization of the City Government, in June, 1832 (Providence, 1843). Woodward, Wm. McKenzie and Edward F. Sanderson. Providence: A Citywide Survey of Historic Resources. Providence: Rhode Island Historic Preservation Commission, 1980. Irish, James R. Historical Sketch of the Town of Richmond, from 1747 to 1876: Comprising a Period of One Hundred and Twenty-Nine Years. Hope Valley, R.I: L.W.A. Cole, Job printer, 1877. Grandchamp, Robert. “With Their Usual Ardor”: Scituate, Rhode Island and the American Revolution. Westminster, Maryland: Heritage Press, 2006. “Guardianships from the Town of Scituate, R.I. 1762-1799.” Rhode Island Roots 30:4 (Dec 2004) p. 206-228. “Gleanings from Rhode Island Town Records: Scituate Town Council Records, 1731-1786.” Rhode Island Roots. Special Bonus Issue 2011 (April 2011). Reference Staff, North Scituate Public Library, “Index to History of Scituate by Hedley Smith” (2006). Special Collections Publications (Miscellaneous). Paper 4. [Fiske, Jane Fletcher, transcriber?] Smithfield 1778 Tax List: “A List of the Polls and Estates Real and Personal of the Proprietors and Inhabitants of the Town of Smithfield in the State of Rhode Island.” Rhode Island Roots, volumes 21 (1995) through 23 (1997). Sanborn, Melinde Lutz. “Smithfield, Rhode Island Death Records Culled from Probates.” New England Historic Genealogical Register 146 (October 1992): 343-351. Steere, Thomas. History of the Town of Smithfield from its Organization, in 1730-1, to its Division, in 1871. Providence: E.L. Freeman, 1881. Bossy, Kathleen, and Mary Keane. Lost South Kingstown: With a History of Ten of Its Early Villages. Kingston, R.I: Pettaquamscutt Historical Society, 2004. Comstock, Charles. A History of South-Kingstown: With Description of the Hornet’s Nest Company, and the Cats Let Out of the Bag, 1806. Hazard, Thomas B. Nailer Tom’s Diary: otherwise, the journal of Thomas B. Hazard of Kingstown, Rhode Island, 1778-1840. Caroline Hazard, ed. Boston: Merrymount Press, 1930. McBurney, Christian M. A History of Kingston, R.I., 1700-1900: Heart of Rural South County. Kingston, R.I: Pettaquamscutt Historical Society, 2004. Miller, William D, and Joseph Torrey. Dr. Joseph Torrey and His Record Book of Marriages. Salem, Mass: Higginson Book Co, 1997. Perkins, P. J. Shipwrecks, sinkings and strandings for Narragansett and South Kingstown, 1880 thru 1940. 1993. “South Kingstown 1757 Tax List.” Rhode Island Roots 13:2 (Jun 1987) p. 37-40. Continued in 13:3 (Sep 1987) 63-67. South Kingstown, Rhode Island Town Council. Town Council Records, 1771-1795 / transcribed by Jean C. Stutz. Kingstown, R.I. : Pettaquamscutt Historical Society, 1988. Stedman, Daniel. Daniel Stedman’s journal, 1826-1859 / transcribed and introduced by Henry Clay Oatley ; edited by Cherry Fletcher Bamberg. Greenville, R.I. : Rhode Island Genealogical Society, 2003. Stedman, Oliver H. A Stroll Through Memory Lane with Oliver H. Stedman: Stories of South County’s Past. Kingston Press, 1978. Watson, Judith Green. South Kingstown, Rhode Island Tax Lists, 1730-1799. Rockland, Maine: Picton Press, 2007. South Kingston, Rhode Island Tax Lists, 1730-1799. Photo by Diane Boumenot. Burroughs, Peleg. Peleg Burroughs’s journal, 1778-1798 : the Tiverton, R. I. years of the humbly bold Baptist minister. Warwick, RI : Rhode Island Genealogical Society, 1981. Durfee, Grace Stafford. Rhode Island tercentenary 1636 1936 historical edition of Tiverton Rhode Island. 1936. (mostly covers historic buildings). Fowler, Orin. An Historical Sketch of Fall River from 1620 to the Present Time: With Notices of Freetown and Tiverton : in Three Discourses Delivered January 24, 1841. Fall River. Mass. : B. Earl, 1841. Simpson, Richard V. Tiverton & Little Compton, Rhode Island: Historic Tales of the Outer Plantations, 2012. Baker, Virginia. The history of Warren, Rhode Island, in the War of the Revolution, 1776-1783. publ. by the author, 1901. Peck, Henry J. 200th anniversary of Warren, Rhode Island : historical sketch, 1747-1947. The Town of Warren, 1947. You can always join the Rhode Island Genealogical Society and let the experts transcribe and index those town council records for you. One volume per year! “Gleanings from Rhode Island Town Records: Warwick Town Council Records, 1742-1780.” Rhode Island Roots. Special Bonus Issue 2012 (April 2012). “Gleanings from Rhode Island Town Records: Warwick Town Council Records, 1781-1801.” Rhode Island Roots. Special Bonus Issue 2013 (April 2013). “Residency Certificates from the Warwick Archives.” Rhode Island Roots 31:1 (Mar 2005) p. 32-39. “Early house lots in the east part of the town of Warwick.” Rhode Island Historical Society Collections, 12 (1919), 129-136. The early records of the town of Warwick. Providence, R. I,. E. A. Johnson company, 1926. Curtis, Harold R. “Warwick Proprietors’ Divisions.” Rhode Island Historical Society Collections, 30 (1927), 33-51. Fuller, Oliver P. The history of Warwick, Rhode Island, from its settlement in 1642 to the present time; including accounts of the early settlement and development of its several villages; sketches of the origin and progress of the different churches … Providence, Angell, Burlingame & co., printers, 1875. Lockwood, Ernest Lapham. Episodes In Warwick History. Warwick, R.I. : City of Warwick historical committee of the Rhode Island tercentenary celebration, 1937. Tillinghast, Samuel. The diary of Capt. Samuel Tillinghast of Warwick, Rhode Island : 1757-1766, transcribed and edited by Cherry Fletcher Bamberg. Greenville, R.I. : Rhode Island Genealogical Society, 2000. Warwick. More early records of the town of Warwick, Rhode Island : “The book with clasps” and “General records” transcribed by Marshall Morgan; edited by Cherry Fletcher Bamberg and Jane Fletcher Fiske. Boston, Mass. : New England Historic Genealogical Society, 2001. Woodward, Carl Raymond. “Rural economy 200 years ago: as revealed in the account books of Benoni Waterman of Warwick, 1733-1740.” Rhode Island History, 4 (1945), 97-106; 5 (1946), 119-128. Baker, Roberta. Bits and pieces of West Greenwich memoranda, 1976. Hey, Catherine. “Gleanings from Rhode Island Town Records: West Greenwich Town Council Records, 1741-1772.” Rhode Island Roots. Special Bonus Issue 2015 (April 2015). Huling, Ray Greene. “Early owners of land in West Greenwich, R.I.” Narragansett Historical Register, 3 (1884-1885), 1-5. Historical Records Survey. Rhode Island. Inventory of the town and city archives of Rhode Island: No. 2, Kent County: vol. 4, West Greenwich. West Greenwich (Town), R.I. “Town Records, 1741-1869.” Manuscript MSS 222, Rhode Island Historical Society. (note: this item comes from Grundset’s Rhode Island in the American Revolution: A Source Guide for Genealogists and Historians, p. 123). Anderson, Robert Charles. “The Colonial Records of the Town of Westerly, Rhode Island” Rhode Island Roots 7:3 (Sep 1981) p. 25-27. [contains an explanation of the contents and numbering of each re-bound early record book in the Town Hall]. Best, Mary Agnes. The Town that Saved a State, Westerly. Westerly: 1943. Larkin, Jessie N. C, and Frederic Denison. Index for Rev. Frederic Denison’s Westerly (r.i.) and Its Witnesses. New York: publisher not identified, 1933. Dowding, George R. Military History of Westerly: 1710-1932. Westerly, R.I: Blackburn & Benson, printers, 1932. O’Connell, Thomas A. Fair Westerly. Westerly, RI: Westerly Historical Society, 2014. Shea, Robert F. Aspects of the History of Westerly During the Civil War , 1957. [thesis: University of Rhode Island]. Utter, George B. Old “westerle,” Rhode Island: Now Constituting the Towns of Charlestown, Hopkinton, Richmond and Westerly. Rhode Island’s Jubilee Year, 1636-1936. Westerly, R.I.: The Utter Company, printers, 1936. “The Patriots of Westerly, R. I., 1776.” The American Monthly Magazine, The National Society of the Daughters of the American Revolution, Washington D. C., (Feb. 1906), 124 – 126. Transcribed on USGenWeb by Susan Irish Nahas. Bonier, Marie L, Claire Quintal, and Raymond H. Bacon. The Beginnings of the Franco-American Colony in Woonsocket, Rhode Island. Worcester, Mass: Assumption College, Institut français, 1997. Daniels, Alanson S. Statistics of the village of Woonsocket : comprising the names of the heads of families, arranged in alphabetical order, the number of inhabitants in each section of the village, with other useful and interesting matter, 1842 … Woonsocket, 1842. Fortin, Marcel P. Woonsocket, Rhode Island: A Centennial History, 1888-1988. Woonsocket, R.I: Woonsocket Centennial Committee, 1988. Newman, S C. A Numbering of the Inhabitants: Together with Statistical and Other Information, Relative to Woonsocket, R.I. Woonsocket: Printed by S.S. Foss, 1846. Thomas, Alton P. Old Woonsocket: Erastus & Doc. Providence: Mowbray Co., 1973. Omitted from the above lists: Architectural and archaeological surveys, church histories, and books about single families. The Rhode Island Historical Preservation Commission has issued Preliminary Survey Reports on the archaeology and historic sites of most or all Rhode Island towns. Always check out local historical societies. Some local libraries in Rhode Island also have local history collections. This post on Rhode Island church records will show you the specific church-related vital records that were compiled by James Arnold. And RIAMCO helps you find manuscript materials in Rhode Island repositories. Grundset, Eric G. Rhode Island in the American Revolution: A Source Guide for Genealogists and Historians. The National Society of the Daughters of the American Revolution, 2014. There was so much additional material in there that I did not find in my other searches. I noted three entries in the list above that I found only in that book, but there are hundreds of others; I urge everyone to consult it. James, Sydney V. Colonial Rhode Island: A History. New York: Charles Scribner’s Sons, 1975. See “Bibliography”, p. 385-411. I thank Maureen Taylor for recommending this book to me; it is so valuable for Rhode Island researchers. Columbian Phenix, Providence, Saturday, December 1, 1810. I purchased this on eBay recently. What surprised me about holding the newspaper in my hand was how thick the paper was – just like book paper. In my experience GenealogyBank.com offers the best selection of Rhode Island newspapers. That’s where I have found 95% of the newspaper items in my genealogy files. If you are looking for free newspaper offerings, look no further than The Ancestor Hunt‘s Rhode Island page. Explore the website and blog, it’s filled with helpful tips. The Providence Journal, Rhode Island’s premier newspaper, does not have historical issues online or indexed (just the last few decades). Hoping we see some progress on that soon. The Rhode Island Historical Society holds the largest collection of Rhode Island newspapers on microfilm, and there were many newspapers over the years. There is little in the way of indexing, however, so you need to know the approximate date you need. Note that the state is small and the capital was ever-shifting, so Providence and Newport papers were likely to carry stories from any part of Rhode Island. A 1965 list of newspapers held in the various Rhode Island libraries is here. The newspapers themselves would be accessed by going to the library and viewing the microfilm. See the other 8 Weeks to Better Rhode Island Genealogy posts by clicking the tab at the top of the page. A card from the Rhode Island index, Providence Public Library. Photo by Diane Boumenot. Property records and the maps that help us understand our ancestor’s location contain some very helpful clues. Even for ancestors whose background we know, maps and deeds can fill in fascinating parts of the story. So let me just say right off, even after years in genealogy, I still tend to look at maps too late in the process of research. Maps should be almost the first thing we turn to. Was the village close to the state line, meaning our ancestors’ records may be recorded in another state? Have we checked all neighboring towns for records? Looking at our ancestor’s street on an old map, is it clear which nearby town would have been easiest to walk to, and possibly find a wife in? What was the nearest church? What nearby waterways provided easy transportation or employment? More and more old maps are coming online. Even if they are for sale, they are often viewable online. Although not listed below, Ancestry.com has also added some of these same maps in the Maps, Atlases and Gazetteers section. This 1795 Harris map shows the northeast corner of the state where my ancestors lived. I find that by matching landmarks in the old maps (for instance, Abbots Run along the east border) with information in my ancestors’ deeds, I can often come close to knowing the location of their property. I was underwhelmed with the selection of digital maps available online, the same few over and over, and lots of state maps showing the names of the towns. I wish more specific content was available for each city and town. Here are the major collections and some of my favorites. The 1870 D. G. Beers & Co. Rhode Island State Atlas shows landowners (link lets you view it at the HistoricMapWorks site). The 1855 Walling map of Rhode Island, with incredible detail, from the Harvard University Library. Harvard really knows how to photograph a map. It’s a great copy. Try other Rhode Island content from Harvard by using this search for Rhode Island and limiting your search to digital objects. To see a map, after clicking the link, you get a screen like this for an 1849 Providence map – click the digital object link that has the word “buttons” in the URL. The map screen is good once you get used to it – change the Viewing Size, then enlarge. Plat Book of the City of Providence, Rhode Island, 1918, on the Rhode Island USGenWeb Project. Likewise, 1893 map of Newport. Norman B Levanthal Map Center, Boston Public Library provides digital Rhode Island maps including an 1741 Rhode Island map, Northern boundary of Rhode Island, 1750, State of Rhode Island 1796, also 1800, 1822, 1838, 1855, plan of the city of Providence, 1844, a map of the city of Providence 1851, also 1875, 1894, and maps of Providence owners or occupants of buildings recreated by Henry R. Chase 1650, also 1770 in four parts: here here here and here. Brown University Library has a decent collection of digital Sanborn Maps for Rhode Island. At the Library of Congress digital collection of Rhode Island maps, you will have to wade through many late 1800’s bird’s eye views of various Rhode Island mill villages, but check out A plan of the town of Newport in Rhode Island (1777), Map of Providence County, Rhode Island, with some of the adjacent towns (1851, include landowners in outlying towns only), Map of Newport & vicinity, or Rhode Island (1860; shows some property owners), and Map of the town of Providence : from actual survey (1823; shows streets). The Portsmouth History Center features maps of original Portsmouth, Rhode Island land grants, created in 1932, using various colors for the era of the occupant. I wish every early town had these. Check this list of names first, then put “land grant” in the search box near the top of that screen, to find the map you need. From the David Rumsey Map Collection: Atlas Map of Providence (R.I.) from 1875. Each plate from the three volumes can be viewed in the “Georeferencer” for an amazing overlay with current Google maps. A search for Rhode Island maps pulls up many statewide maps as well. The Georeferencer screen for plate 38 of the 1875 Providence atlas on David Rumsey Maps. It show my ggg-grandfather’s rented home adjacent to Silver Lake Basin, a former body of water that is now a large parking lot with a flea market building (white streets are the current streets). The old map and the new Google map matched together instantly when I pressed the button. Fascinating to see the streets/features that are still the same and the ones that have changed. Obviously, there are historical maps in paper collections that could be very helpful. The Rhode Island Historical Society has a wide collection. To buy wall maps, Rhode Island’s own Map Center located on North Main Street, Providence, will sell you reasonably priced maps. Many time over the years, I have purchased CD’s and a few paper maps from the Rhode Island collection at Old Maps including the 1831 & 1855 maps on CD, and the 1870 Atlas on CD. This lets me keep them permanently on my computer, and open them to whatever size I want. A guide to Providence County place names is here, mostly pulled from 1600’s records. I will add more sources as I find them. Deeds treat us to a glimpse of our ancestor’s financial and home life. Was it a big farm? Did they have a mortgage? Did they keep the land their parents had, or strike out on their own? Did they lose their property at some point, and why? And most of all, where was this homestead? Does knowing the “abutters” or neighbors clarify a genealogical detail for us? Did your ancestor buy an extremely expensive house in 1798 which he could never, possibly have afforded, lose it in 1800, and then lived the rest of his life in poverty and you cannot figure out how that happened and it keeps you up at night? (but I digress. On with the deeds). In Rhode Island, deeds are kept in the town that the transaction occurred in. As new towns split over time, deeds tended to remain in the original town, although there are exceptions to that so always check the town website to see what deeds they hold. Finding microfilm listings for Smithfield, Rhode Island, prior to ordering them. It may not be widely known that slowly, some Rhode Island towns are moving their deeds online and in a few cases, that includes historical deeds. Check this site for the town you are interested in, although you may also need to consult the town/city web page to find out which years are in that system. I am finding no deeds on Ancestry.com, however, a few deeds drifted into the “probate” category – look over at the Week 3 post on Probate, and follow instructions there to pull up the record set. Lydia Lamphere signed a deed of sale (with her mark) because she was required to give up her right of dower in the property that she and her husband sold. Brief Westerly deeds abstracts 1725-1758 are available towards the bottom of this USGenWeb page. Thank you, Susan Irish Nahas. The published volume of Rhode Island Land Evidences 1648-1696 is available on FamilySearch.org. Home Lots of the Early Settlers of the Providence Plantations by Charles W. Hopkins is also available online. East Greenwich deed index, town hall. Great news! Ancestry.com has recently posted over 800 record sets related to Rhode Island probate. They are listed at the bottom of this post. There is so much more there than I thought; see the top of the list for instructions about finding each record set. Wills and probate records can tell us about relationships in our ancestor’s lives that no other document can reveal. Cemetery markers, even if read and recorded long ago, can often be the only physical artifact left behind to tell us about a life. Probate won’t reliably provide us with helpful lines such as “I give the land received from my honored father, Marmaduke Shipley, to …” But they reveal so much else. Often naming all surviving children, who may have the very grandparents’ names we are seeking. Or showing us the choice of Administrator or Guardians of minor children; were those significant people known to us? Evidence of economic status can help us in building a case for a certain father as opposed to another by the same name. And don’t get me started on the probate records of childless adults – they were often required to name every relative. More than anything, it’s funny how the documents of the dead can bring them to life. Two aprons left to a daughter. An iron kettle. A chiming clock. A cow and calf. Or, in the case of my New England ancestors, 3 barrels of hard cider in the cellar. Add to that proximity in the cemetery to extended family members, or to the original family farm, and these are very important records for genealogists. Asa Aldrich’s 1818 will as recorded in Cumberland, R.I. probate. All probate records were kept by the town, although be careful about shifting town identities. A huge set of these records is now available online through a paid account on Ancestry.com (see bottom of this post). Otherwise, to see the probate records you need, a visit to the town hall may be necessary. Each town hall usually has staff devoted to probate records, to take care of the current probate business, and they can help you find the old records. In some cases, microfilm copies may be necessary if the files you need are not online or if you cannot get to a town hall. The Rhode Island Historical Society has a few town probate records (try the card catalog before leaving home), also the New England Historic Genealogical Society in Boston. Microfilm for most towns can now be viewed at the local FamilySearch Center but using their computers for digital access. There are some index/abstracts published in a few places. Volume 16 (Rhode Island Will Book) of The Rhode Island Genealogical Register by Alden Beaman and Nellie M. C. Beaman (Princeton, Mass: periodical volumes 1 – 20 published 1978-1998). Out of print and protected by copyright (so, not online), the books are available in most local library collections that cover genealogy. Volume 16 is an index of town probate abstracts covered in volumes 1 – 15 of the periodical. A few other probate abstracts also appear in later volumes. The abstracts themselves are not perfect but this is certainly a useful guide for locating the probate records mentioned. But of course the set of abstracts is very far from complete for the state. An index of Providence probate records is in the book Index to the Probate records of the Municipal court of the city of Providence, Rhode Island from 1646 To and Including the Year 1899 by Edward Field, Providence: 1902. This data is also available online through NEHGS membership at their website, americanancestors.org, and its available on Ancestry.com. Quick tip: Since probate usually was processed over a period of time, there is often more than one entry in the town probate books. Check for additional records. Also, different parts of probate may have been saved separately – for instance, wills, inventories or guardianship papers may have their own volumes. Family Search.org has a miscellaneous collection of Rhode Island probate records. To find them, go to SEARCH –> CATALOG, and use Place = “United States, Rhode Island,” subject = “Probate,” Search these Family History Centers = “Online.” Then drill down to the exact location using the “PART OF UNITED STATE, RHODE ISLAND, PROVIDENCE” link to go to Providence County, the use “Places within …” to find the town of your choice. Clicking around will bring up any of the counties, and from there, the towns. Quick tip: Don’t assume that because there is a probate record for your ancestor, the death must have been recorded in the town records. Sometimes, probate is the only record of a death. And sometimes, a death was recorded but there were no probate activities. Of course there are many other records associated with more recent deaths – I notice Ancestry.com has a growing collection of Funeral Home records. Obituaries will be covered later, with newspapers. Rhode Island has many, many tiny old cemeteries. Early on, with no central church to manage burials, families tended to use a spot on their own property for a private cemetery. Later, more formal, locally managed cemeteries were created, and sometime, older burials were moved to newer cemeteries, so don’t let the date of establishment of a cemetery fool you. As land use changed and towns expanded, conditions were not ideal for protection and care of these small cemeteries, so those seeking out these graves today sometimes have difficult conditions to grapple with. Over the years, and today, there were many dedicated individuals recording and caring for small cemeteries. Sometimes, those early recordings have become the only record of markers now fallen and buried. The Rhode Island Historical Cemetery Commission is my first stop for research. A significant portion of the excellent work done over the last century and a half has been combined into their records. If a picture is available, that will be indicated. William Hardman died in 1870. R.I. Historical Cemetery Database is telling me that he is buried in PV005 – Grace Church Cemetery. Since many old Episcopal Church records are available at the archives of the University of Rhode Island Library, I already knew (see a blog post on my visit to the archives) that William Hardman was at Grace Church Cemetery – I was able to use the card index there and see the map of his plot. The Rhode Island Genealogical Society has published several thorough books on local cemeteries. See a complete list, and some EXCELLENT ADVICE FROM AN EXPERT, here. Find A Grave is another site worth searching, and would be a good place to record your own discoveries and pictures. And now, a list of records that I am going to be pursuing for months. Recently, Ancestry.com posted some records online: Rhode Island, Wills and Probate Records, 1582-1932. There are selected record sets (from microfilm rolls) from 37 of Rhode Island’s 39 cities and towns. The set for Providence is huge. An example is below. Widow Margaret Hardman served as administrator of her husband William’s estate in 1870. I like how the bottom navigation bar shows me which file I’m on. The actual will was signed with a shaky hand on August 12, 1870, the day of William’s death. You could search the set by name (see Randy Seaver’s recent post about indexing and other problems with the Massachusetts set). But if you want to access specific books to check for yourself, Ancestry makes it cumbersome but it is possible. All record sets are filed alphabetically BY COUNTY – but Rhode Island probate is kept by town. The titles never include the name of the town, so, I have gone through each county and sorted the titles into the proper town. I doubt my list of over 800 record sets is perfect, and the titles themselves may have issues, but the list is below. I built it for myself because I can’t think of any other way to access these records. Rhode Island, Wills and Probate Records, 1582-1932. Choose the county then look for the exact title. First, find the titles you are interested in, below. Then go to Rhode Island, Wills and Probate Records, 1582-1932. Find on the screen the “Browse this collection” link in the side column. Choose a county. Then all record books for the county will appear in the drop down menu (Providence county takes a while to come up – be patient). Knowing, from the list below, the exact title you might want, you just look for that title and select it. Be careful because some of the titles are VERY similar. Good luck! A three-minute VIDEO walking you through how to locate the Ancestry.com records is available HERE. Be sure to click the blue button with the triangle to start the video. And don’t forget to come back! Hopkinton (lucky Hopkinton researchers can bypass all this by using the transcribed records from the Hopkinton Historical Association (free!) – Probate 1757-1850 HERE). Probate records: Bonds 1 (1873-1890) ; bonds 2 (1890-1907) ; docket 2 (1896-1930) ; index 1 A – Z (books 1-45) 1696-1907. A demo of the steps needed to use the record sets, above, can be found here on Randy Seaver’s blog. Thanks Randy! Welcome to Week Two of 8 Weeks to Better Rhode Island Genealogy Research: Census Records. Census records are an important way to keep track of our ancestors, and they provide one of the few long-term views of our ancestors’ comings and goings. Finding family in the 1940 federal census, and working back from there, can get almost anyone started in U.S. genealogy. These census records are also available on many other genealogy websites and the list is growing all the time. I keep the census headers nearby at all times because they are often unreadable on digital census pages. I like these from Familysearch wiki (although they don’t include 1940) and I managed to add them to my two desktop backgrounds (using Picasa) so I always know where to find them. Federal census headers as screen backgrounds. It actually took me a while to accomplish this. Have you ever thought about which VERSION of the federal census page you are seeing? I love this article by Rhode Island genealogist Jeffrey Howe: Shortcomings of the 1850 Census by Jeffrey Howe, Rhode Island Roots 24:3/4 (Sep/Dec) p. 259-264. And this warning from Cherry Fletcher Bamberg: Navigating the Shoals of the 1810 Census and Beyond, Rhode Island Roots 37:1 (Mar 2011) p. 13-16. Census pages were copied over, reproduced, filmed, and distributed in many different ways. It’s important to think about whether we could, perhaps, find a better version. A search on Internet Archive brings up a DIFFERENT copy of the census, from a microfilm which must be paged through. But speed up your browsing by noting the page number on the census page you already have. when you open the reel, you have to browse through it. Get the page number from the original census you saw, to help you find the right page quickly. Archive.org doesn’t have everything, though. Quick tip: What with bad handwriting, fuzzy images and faulty indexing (and believe me I have won the trifecta on that a few times), you may find on occasion that you need to pull up a location and go PAGE BY PAGE, looking at every name. There’s a badge for that, I think. It’s called genealogist. So, good job! The links above would work well for that because you can go to BROWSE and narrow it down to the town. One last thought: because Rhode Island is a small state, I was able to acquire compiled volumes of the federal census years 1790, 1800, 1810, and 1820 for Rhode Island rather cheaply as used books. These are very handy for seeing a whole town on just a few pages. Particularly for cases where spelling is unpredictable, like Lamphere, it can be better than searching. 1790 is a 1977 reprint by Genealogical Publishing, complete with a fold-out map, of what is a fairly complete transcription [or see a pdf version by the Census Bureau HERE]. 1800 is an index by Lowell M. Volkel. My 1810 and 1820 index books are by Ronald Vern Jackson. There’s nothing like seeing every name for a town on just a few pages in these old compiled census volumes for 1790, 1800, 1810, and 1820. Rhode Island enumerated the state population in the “-5” years, between the federal census years. Some of those survive. In the colonial era, a few census-like records were made. To get a more detailed listing of early census records, don’t miss the words of wisdom on the R.I. census records at the Rhode Island Genealogical Society website. The most commonly used Rhode Island colonial census records are for 1774, 1777, and 1782. A list of sworn freemen, compiled 1747-1755, also serves as a kind of census. MacGunnigle, Bruce C. Rhode Island Freemen, 1747-1755. Baltimore: Genealogical Publishing Company, 1982. Look for additional freemen lists in the Records of the Colony of Rhode Island. Holbrook, Jay Mack. Rhode Island 1782 Census. Oxford, Mass. : Holbrook Research Institute, 1979. There are also newer transcriptions of the 1774 and 1782 census that are more faithful to the originals. Try finding the better 1782 transcriptions here and the re-transcribed 1774 census records printed, town by town, over a period of several years in Rhode Island Roots, volumes 29-35. Although not a census, the remaining fragments of the 1798 Direct Tax records (a federal fundraising effort administered by the states) can be very valuable for finding homeowners if your town’s records survive. This is available at the Rhode Island Historical Society – Robinson Research Center. Portions of the Newport lists are here at Internet Archive. Rhode Island state census records are available for 1865, 1875, 1885, 1905, 1915, 1925, and 1935. Each census is quite different. 1895 did not survive (so, that was unlucky). 1865. Probably my favorite census of all time. It’s so complete, and the handwriting on the Providence pages is just perfect. It shows all members of the family, plus a full address, occupation, which school attended, place of birth (state or country, except if Rhode Island, and then the town is given), deaf, dumb, idiot, pauper, or convict, and military service. This is a unique opportunity to learn important details, so definitely try this one. My 4x great grandparents, the Lawrences, beautifully enumerated in Providence in 1865. The 1865 census pages can be found on Ancestry.org. This page will allow you to search most of these Rhode Island State Census years. Note that 1905 is not in that collection. 1875. Similar in structure to the 1865 census, and will work from the same Ancestry.com link. Other than the Ancestry.com copies, the only other place I know to see 1865 and 1875 is at the Rhode Island State Archives. Possibly, microfilm copies may be held at other libraries. 1885. This is a confusing census, recorded in books where Male pages were separate from Female pages and entered in order only by first letter of the last name. You would expect to find, say, daughters with mothers, but children seem to be separated also, meaning that one family may be on 3 or 4 different pages, with the only connection being the city, ward, district and family numbers, not necessarily searchable. Have I lost you yet? This census can be found here on FamilySearch.org, and at the 1865 Ancestry link. This is the FamilySearch.org screen showing the front of Catherine Ross’ card. But the transcription provides place of birth of parents for the PREVIOUS card. Click through to the card, then click to the next page, to see the REAL info on the back of Catherine’s card. Warning: FamilySearch.org is the only place I know to get the 1905 census online, but each record is indexed with some wrong information. Place of birth of the two parents is taken from the PREVIOUS card. To see the real data on the back of your card, click through to view the front more closely, then use the circled arrow in the top corner to click to the NEXT card; that will be the back of your card. Search here on FamilySearch.org. 1915. The national origins of parents are recorded as well as some occupational details, on normally laid out pages, in order by street address (the layout is similar to federal census records). The 1915 census can be found on Ancestry.com as well as this link at Familysearch.org. My great grandparents, Russell and Eva Darling, living very near to her parents, Louis and Jessie Murdock at 337 Friendship Street in Providence, as seen in the 1915 census. They have a friend, Mabel, boarding with them too. 1925. This census is more perfunctory, recording families in order by address, with only minimal information, including marital status, place of birth, and age. Find this census on Ancestry.com as well as at this link on familysearch.org. My grandfather Miles Baldwin, captured with his mysterious first wife Mary in the 1925 census at 93 Somerset Street, Providence. 1935. For this census, the state entered some kind of punch-card era with small cards. There is some good information on these, including birth date. Note the cards below, for my grandmother’s uncle Charles Falkenburg. He was enumerated twice, once in January 1936 and again in May 1936, and the data shows some important differences about his success at finding work in 1935 (many of my relatives were in the fine jewelry industry, which really never existed in Rhode Island again after 1929) and about his place of birth, which I believe really was Germany. A good example of how the census can make us nuts. The first example shows Uncle Charlie born in Germany. Second example of the 1935 census shows Uncle Charlie born in New York. I’m really not blaming the census taker, I’m sure he or she wrote what they were told. Access the 1935 census on familysearch.org and on the link for Ancestry.com. These local census records need close examination and study, but they can fill out your ancestor’s story beyond what is seen every ten years in the federal census. I encourage everyone to explore them fully.